"Mama, you gotta kill them all. They know you're crazy." 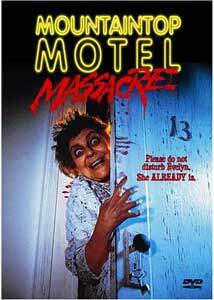 What is it about motels, from the Bates Motel to Farmer Vincent's Motel Hell, that inspires such uneasiness? Is it the fact that you don't know for sure that they've changed the sheets or who has been there? Or that you know that there's a camera hidden somewhere in the bathroom? The tradition continues with the Mountaintop Motel in backwoods Arkansas, where you can get a room for seven bucks....but might never check out. Evelyn (Anna Chappell) spent time in the Arkansas State Mental Hospital, but was released in 1981 to return to her motel, where she lives with daughter Lorri (Jill King). Lorri's father is dead (whether killed by Evelyn is never made clear), who Lorri is trying to summon back from the dead. Evelyn, working in the garden, kills Lorri's pet gerbil, and the blood sends her waaaaay off the deep end. Catching Lorri at her satanic practices, she uses her sickle to make short work of her, then calls it a 'gardening accident.' Unbelievably, the authorities swallow this one, setting things up for our film. It is, of course, a rainy night and a number of travelers take refuge at the Mountaintop. These include a pair of newlyweds; Crenshaw (Major Brock), an elderly black carpenter; Reverend Bill (Bill Thurman), a drunken preacher; and advertising man Al (Will Mitchell) who has convinced a pair of nubile coeds that he is a Columbia Records executive. What they don't know is that Evelyn has tunnels to each cabin, where she releases rattlesnakes, rats and roaches as the appetizer for her main course of terror served cold with the sickle. As is the case with most 1980s' slasher movies, this one depends heavily on aggressive stupidity on the parts of the victims to keep things moving. Even though halfway through the potential victims are aware of what's going on, they persist in separating and not staying together for protection. This symptom hits fever pitch in the concluding reel, when all the survivors go down into the tunnels to look for Evelyn, for no good reason other than to provide some more gory murders. There is some suspense generated in this sequence, but it's completely artificial and incredible. On the positive side, one doesn't often see a middle-aged woman serial killer; Anna Chappell nicely captures the vacant stare of the complete psychopath. The victims, other than Crenshaw, are played by marginal actors at best. Most of them are amateurish to the point of being painful. The use of a hand sickle as the murder weapon is innovative, and underlines the rural backwoods setting, evoking The Texas Chainsaw Massacre and tales of Ed Gein on top of the motel motif. The camera work is generally more accomplished than one would expect from a low-budget feature like this one; especially notable is an overheard shot of Lorri's funeral. However, when the killing starts, the camera goes haywire, and it's seldom possible to get a good look (or even a good idea) of what's happening. This is probably a blessing; the effects that we do see are poor in the extreme. However, it makes certain episodes extremely difficult to follow, such as the tussling in the tunnel. Probably the best part of this movie is the weird closing sequence, which makes the viewer question just what it was we saw for the previous hour-and-a-half, and what was motivating it. This lends a layer of ambiguity and thought to the picture that is missing from the garden variety slasher flick. While not a classic, you could do worse in the genre. Oh, and never look at motel sheets with an ultraviolet light. Trust me on this one. Image Transfer Review: The picture is presented in 1.85:1 anamorphic widescreen (despite the keepcase cover declaration that the transfer is 1.66:1). Considering this is an early 1980s ultra-low budget horror film, this disc gives it a shine and polish that it's probably never had at all, even in its original theatrical run. There's not a speck of damage to be seen, colors are vivid, blacks are rich and dark, and no compression artifacts are visible. This movie looks like it was shot yesterday. A phenomenal piece of work for a movie that questionably deserves it. Why can't major catalog titles look this good? Audio Transfer Review: The 2.0 audio track is easily the equal of the video transfer. The sound is crisp and clear, with excellent range and bass. Car sounds and the ambience of the omnipresent rain are naturally rendered and immerse the viewer in the picture. The weird sounds, voices and chanting that Evelyn hears are presented in a truly chilling manner that adds a great deal to the effectiveness of the movie. No hiss or noise is present. Again, far better than the movie probably deserves. Extras Review: The only extra is an anamorphic trailer that spoils each and every one of the murders. Avoid it until after watching the feature. The disc is very well-chaptered. Although production notes are supposed to be on the reverse of the cover sheet, our review copy had nothing at all there. A somewhat odd and unsettling slasher movie, given a first-rate audio and video transfer by Anchor Bay. Short on extras, it's worth a rental if you're up for some mayhem. It may not be a great film, but it's a great-looking and sounding disc.